In part one of this three part series, I presented an overview of some vintage razor blade planes. In part two, Eric Alstrom gave some tips on using them. Here, I explore some of the issues I grappled with while attempting to come up with a razor blade plane specifically designed for leather. I have found there are four basic problems with existing razor blade planes when used to pare leather: the blade is usually at too high of an angle, the poor quality metal they are made out of creates excessive friction and threaded parts can strip out, the blade height is difficult to adjust and standard razor blades, because they are so thin and designed for hair, are not ideal. Bruce Matthews published some plans and images of a plane he designed for model making, primarily dealing with balsa wood. In order to correct some of the limitations of a flexible double edge blade, he used a single edge blade that has a back stiffener. I adopted these plans for a plane specifically designed for leather. First, I lowered the blade angle to about 20 degrees. Secondly, I made the body out of a single piece of milled aluminum, rather than friction generating wood. I also milled the front of the plane a bit more to create space for leather parings and used magnets to hold the razor blade in place before final clamping, to aid in blade adjustment. 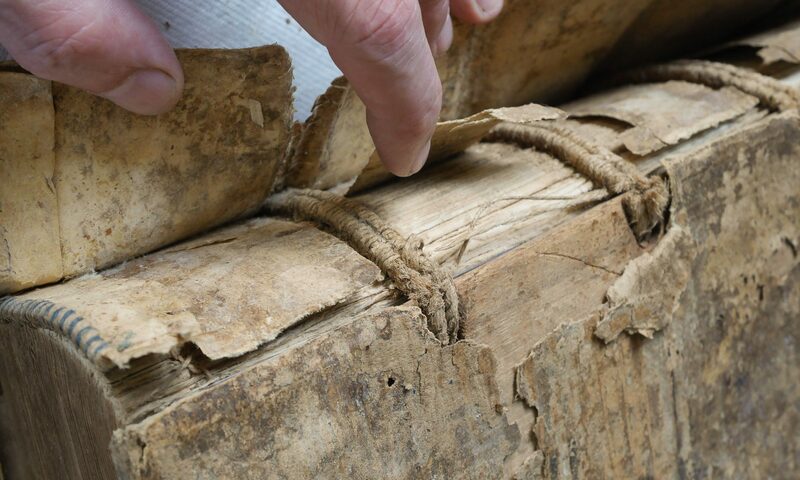 The most difficult problem was edge retention of the blades – this problem still needs to be resolved. Other than carbon steel and stainless steel, there are ceramic, ceramic coated,tungsten carbide, and diamond coated carbide blades. Ceramic blades were too brittle, and diamond coated carbide blades were too expensive. So I experimented with two possibilities, ceramic coated blades and carbide blades. The ceramic coated blades reduce the initial cutting performance to an unacceptable degree, but the carbide blades performed reasonably well, although they are not as sharp initially, they have a much longer, more gradual use time, though seeming not as long as the 75 times some suppliers claim. High carbon blades cut great initally, but don’t seem to last as long as one would hope. Or course, this is part of the expense for the convenience of disposable blades. Three blades, spanning 100 years, all with nearly identical hole spacing. On the top, a circa. 1910 Gillette,in the middle a 1990’s Scharf-fix, and on the bottom a 2011 Tungsten Carbide industrial blade. Most modern double edge razor blades have some sort of proprietary slit cut through them, but all of the ones I have tried fit into the three hole system pictured above. Note: The Gillette blade is stamped “NOT TO BE RESHARPENED” and “DESIGNED ONLY FOR ORIGINAL USE IN GILLETTE HOLDER”. I hope that the Gillette police are not watching, but perhaps the easiest solution for rapidlly dulling blades is to resharpen them. This can be done by hand or with various antique machines. Carbide blades are too hard to be stropped or resharpened by hand. Stropping a razor blade. A strong binder clip is a simple way to hold the blade. A simple holder is to use a one inch wide binder clip on a horsebutt strop prepped with .5 micron chromium oxide, followed by a final strop on undressed calf. The binder clip is lightweight enough to allow a feel for the flexing of these thin blades, making sure to sharpen them on the bevel, although I tend to take a couple of degrees off the angle to make the edge a bit more robust. This can be done a number of times before the angle becomes too obtuse. The blades flex quite a bit, so a slow, gentle touch is necessary. 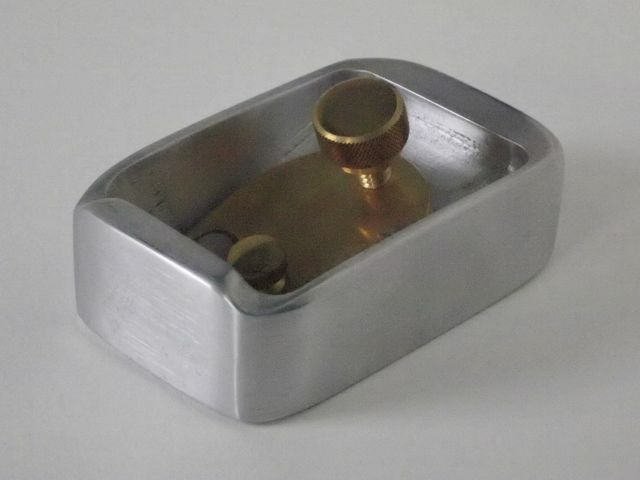 There are various devices for resharpening double edge razor blades. 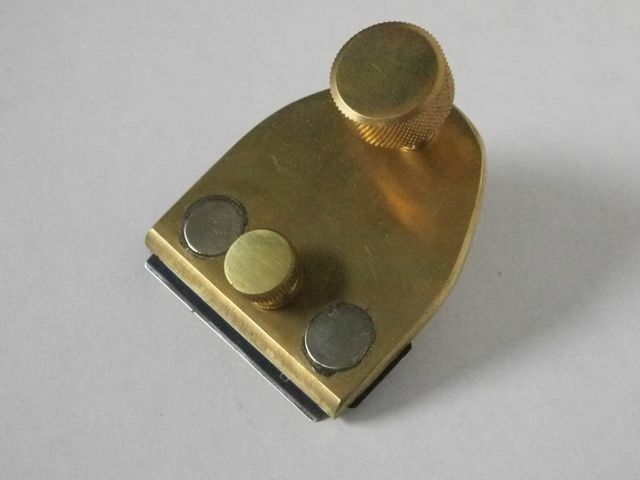 One common one is the Twinplex Stropper. There are many versions of this device, though all are similar in that both edges of the blade are sharpened on one side, and then the blade is automatically flipped and the other side sharpened. This is much quicker than hand stropping. This is the result of trying out a number of ideas to develop a better razor blade plane for paring leather. I don’t think it works better than a spokeshave, but it is easier to adjust than a Little Giant or Wilkro. It might be useful for specific circumstances, like paring very thinly, or for those who don’t want to bother having to resharpen their blade. The body is 6061-T6 aluminum, the blade cap and screws brass. Two rare earth magnets hold the razor blades in place for adjustments until they are securely clamped. 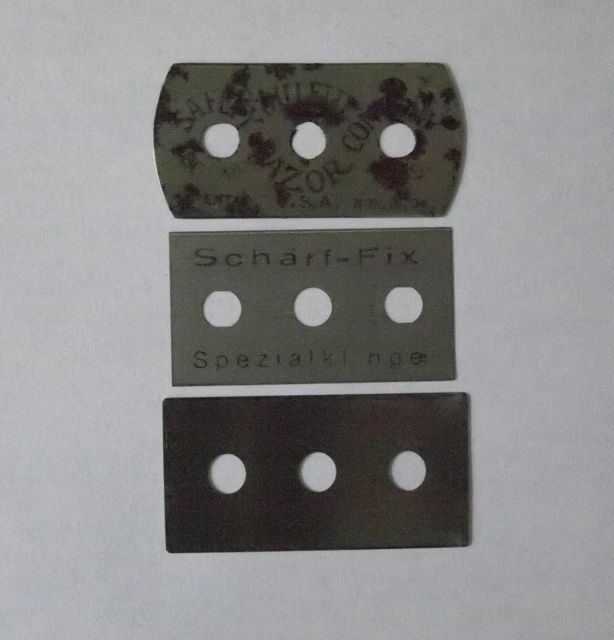 Either standard double edge razor blades, Scharf-Fix blades, or industrial three hole Tungston Carbide blades fit. Blade cap with magnets to hold the blade in place for depth adjustment before tightening. I used magnets to hold the razor blades in place until final clamping, and also used a blade cap more like a normal block plane. Blades can be changed without an additional tool. Since everything on the plane is nonferrous, the magnets only stick the blade to the cap and allow it to be adjusted from the tightening knob. This makes tightening easier, but still takes a little practice, much like a spokeshave. It cuts quite differently than a a spokeshave or a Scharf-fix. It splits the thickness of the leather more like a paring machine, but allows more immediate depth of cut adjustment by adjusting hand pressure. Like a spokeshave, it it relatively easy to achieve long, gradual bevels. 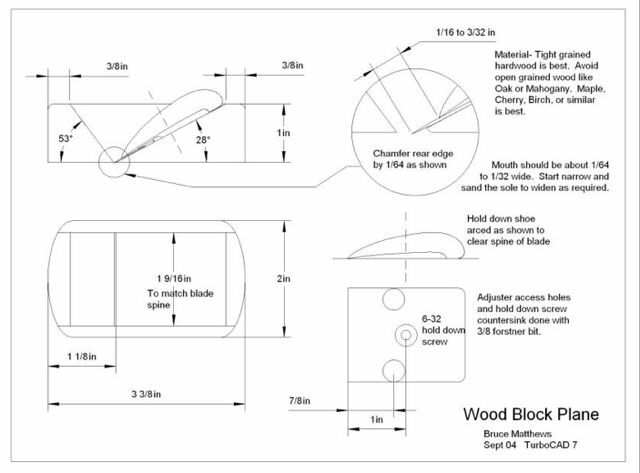 It is also easier to pare larger, flat areas than with a spokeshave. Below is a video of it in use. I find it easier to use parallel to the edge of the leather. At the beginning I’m taking a fairly aggressive cut, but later taking lighter, quicker ones to even the thickness. I’ll keep tweaking this plane and bring it along to the Guild of Book Workers Standards of Excellence Seminar, October 6-8, 2011 in Boston. Looking forward to seeing this in Boston! Hi I am very interested in the double edge razor blade leather plane. Can I purchase one? I spent (read wasted!) an inordinate amount of time trying to perfect this. In the end, I couldn’t get it to work as well as the modified 151 spokeshave that I sell. The alterations I do to these spokeshaves, with the much better A2 blade, make it easier to use, safer, and more versatile than any razor blade plane I’ve used. The only drawback is that you need to resharpen the blade. But this is also an advantage, since you do not need to purchase razor blades. 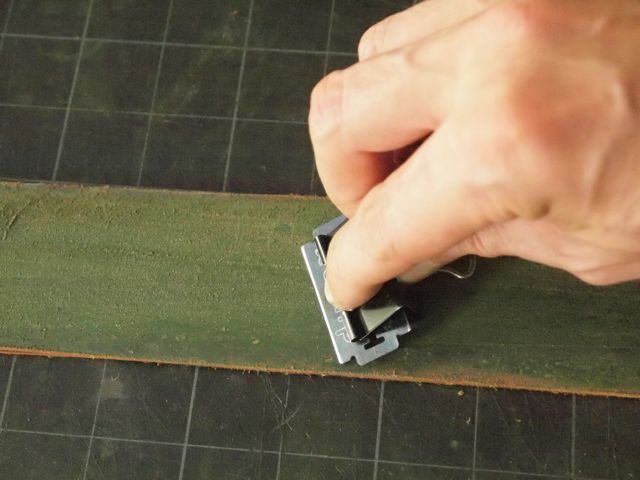 Interesting ideas for stropping vintage double edge razor blades.